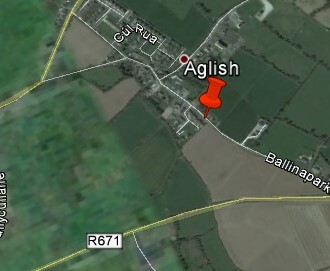 To the east of Aglish, R671, in Curraheen, a friary was established after the dissolution of the monasteries by Franciscans from Youghal. Youghal was the first friary in Ireland. Persecution forced the friars across the river into Co. Waterford in the seventeenth century, but they retained the privileged title of Youghal. Soon after the Williamite period, certainly before 1739, the friars transferred the Youghal foundation to Curraheen and served in the church at Aglish. The surviving residence was built about 1845, but the last friar of Youghal, Fr P. D. Lonergan, died at Curraheen in 1862.